← Tasting Notes – Bruchladdich 16, Bourbon Cask and Highland Chief. I sought recommendations, and was leaning toward Irish Manor when the work week got incredibly busy – it happened that I went shopping ON St. Patrick’s day. There is both a Total Wine and a BevMo near my house, and since their spirit selection is pretty equal, I headed out on the main road resolved to stop at whichever I saw first. It was Total Wine. Along the back wall they had a whole bookshelf dedicated to Irish Whiskey, but as I looked closer I was a bit disappointed, easily 1/3 of the options were sold out, and another third were well out of my “munitions grade” price range. Half of what was available and affordable was varieties of Jamison and Bushmills – not that there is anything wrong with that, but I wanted something a little less popular, maybe something I hadn’t tried before. After all that narrowing, I had four or so to choose from. Four brands, (some had more than one expression) none of which I’ve tasted before, and all with similarly glowing recommendations on the shelf label. I analyzed each one, trying to make a choice, then trying to set a parameter on which to base my choice. Finally I had a bottle in my hand., Finnegan’s 8, but not the single cask. Honestly, I chose Finnegan’s because of the song (which I twisted for the title up there.) And on my way to the register, I saw the big St. Patrick’s Day end-cap, full of Irish beers and whiskey. I sighed, but decided to keep what I’ve already spent too much time choosing. 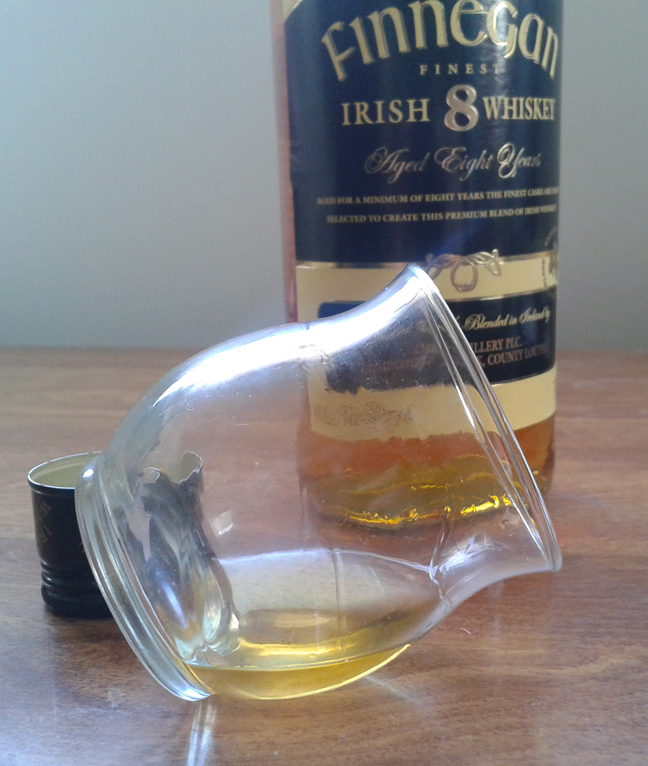 This is a honey-coloured whiskey, and is takes a few moments for legs to form. When you swirl it the first time it wants to sheet before legs start to slide down the glass. The sweetness is not limited to it’s color, as the nose is full of light citrus and caramel candies. There are hints of vanilla and wood, so I am reminded of walking into an old fashioned sweet shop with penny-candy in old barrels. On the palette it speaks softly; whispering the sweet promise that started at the nose. The caramel is strongest, trying to dampen loud alcohol notes that betray this dram’s youth. It is not unpleasant, but just a little more raw than I’d prefer. The vanilla is there too, with other earthy notes of wood, grass, and citrus. Though quiet, these flavors linger and even minutes later I still have the sensation of a whisky-filled caramel candy that was long in its wrapper on my palette. And even after that fades, the citrus lingers, coaxing another sip. Overall, I’m very happy with this dram, and wouldn’t hesitate to recommend to those who like a little sweetness in their Irish Whiskey. And I’m very curious to see if there are older expressions from this distillery. I think I know how The Knot is made. You see, I happened to leave the wee-ist of portions in my tasting glass overnight, and what I came back to was a sticky sweet candy-like syrup. I imagine if I re-hydrated that with a high-proof flavorless spirit, I would have The Knot. No honey, or other flavorings added. 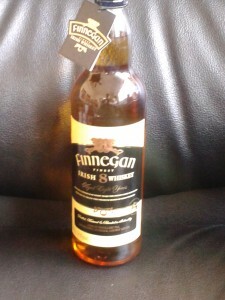 This entry was posted in Irish and tagged Irish Whiskey, St. Patrick, tasting notes. Bookmark the permalink.